Potential spoilers ahead for Game of Thrones. Game of Thrones has been absolutely polarizing in Season 6. While many naysayers worried that the show would suffer due to the lack of George R.R. Martin’s newest novel, the folks over at HBO have been doing a great job at truly giving fans what they want. Jon Snow has risen, it looks like he and Sansa will finally reunite, Bran and Rickon are back, and it seems like we’re finally going to find out who the hell Jon’s parents are. Last episode also hinted at another popular fan theory, which may be coming to the small screen this season: the Cleganebowl. The Cleganebowl is a popular Game of Thrones theory that revolves around the Clegane brothers: Gregor Clegane aka The Mountain aka Cersei’s zombie friend Ser Strong and Sandor Clegane aka the Hound. The theory is that the brothers will face off against each other in the trial by combat to decide Cersei’s fate in front of the faith militant. Queen C will obviously use Ser Strong as her champion, and the twist is that the Faith will call upon a recently healed Hound as theirs. 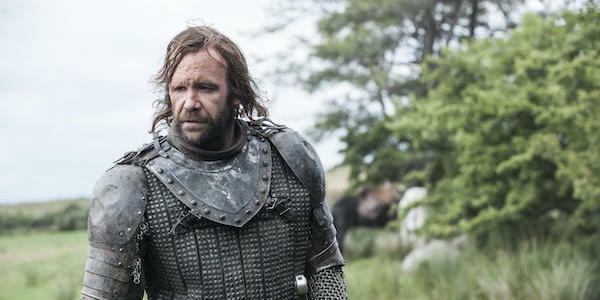 We never actually saw The Hound die in Game of Thrones, and fans have been wondering if he managed to survive his myriad injuries at the hands of Brienne. The Hound and The Mountain finally facing off this season would make sense for quite a few reasons. For one, newcomer actor Ian McShane dropped a few spoiler-y comments before the season began airing. Namely, that he’ll be bringing back a beloved character who everyone thinks is dead. Considering that Jon has already been revived and Rickon is back into the narrative, there aren’t many more characters whose fate was left ambiguous. The Hound seems like the only logical choice. Additionally, we were reminded of The Hound’s fate in the last episode of Game of Thrones. Arya goes through her list and mentions that she didn’t want The Hound to die, which is why she didn’t put needle through his throat. In the same episode, The Lannisters discuss their plan for a Trial by combat, which seems more than coincidental; it had been a full season since we last thought about The Hound. Finally, we never got to see The Hound and The Mountain resolve their conflict with each other. While the Mountain isn’t really himself nowadays, the Cleganebowl would serve to finally conclude the Cleganes’ plot line once and for all. Since Season 6 seems to be in the habit of finally giving some closure to fans of the series, the Cleganebowl is right on brand for what HBO has been producing. I wasn't even sure that when I delivered the episode it was really clear. It was like a fun little bit, but I wasn't sure it was really clear that he had these amorous feelings for Brienne. I'm always amazed what fans pick up. For more awesome tidbits like these, be sure to check out all of our other awesome Game of Thrones coverage. Game of Thrones airs Sunday nights at 9 p.m. ET, only on HBO.